Graffiti is an incredible art form that brings instant engagement for our students when we bring it into our classroom. Los Angeles teacher Sara Gaechter is on the show to talk about the projects she uses to introduce graffiti to her students. Listen as she and Tim discuss how to deal with the illegal aspects of graffiti when you are talking to kids (6:15), how she connects with street artists via social media (10:30), and examples of the works her kids create in her classroom (13:45). Full episode transcript below. 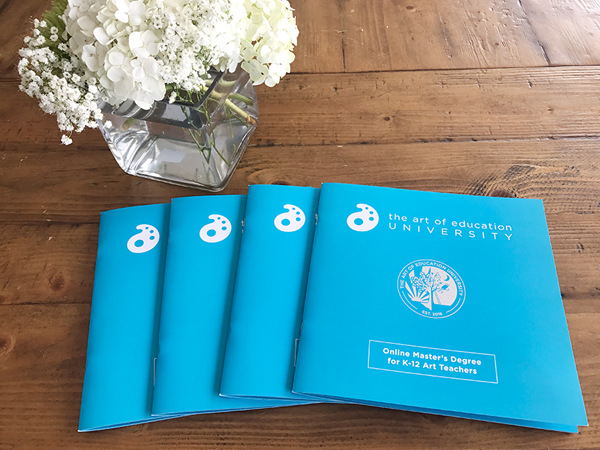 Welcome to Art Ed Radio, the podcast for art teachers. This show is produced by The Art of Education and I’m your host, Tim Bogatz. I need to start today by telling you a little bit of a story. This took place at the NAEA conference in Seattle back in March. Now when I go to conferences, whether they are state or national ones, I’m usually there to do a couple things. First is to work the AOE booth, help promote AOE, but more importantly, meet people who love listening to the podcast or who’ve taken a course with me or just kind of love the AOE site in general. And, I’ll be honest, there are always a few people who just want to steal the awesome buttons that we give out as swag without actually talking to anybody which is cool enough, that’s fine, but you know every once in a while you start to see people taking like armfuls of pins and buttons and just shoving them into their bag. Like, one is enough people. And I always assume that those people are stealing all of our buttons are the people who haven’t cleaned out their art room in the last decade and their storage closet looks like just and episode of Hoaders. Kind of like Andrew to be honest. Hey, but my second goal at conferences as is always there on the lookout for new people to work with. Maybe it’s for a podcast interview or maybe and article or an Art Ed Now Conference presentation and I love that part of the job because it’s such a great opportunity to see just a plethora of new ideas and great ideas about art teaching and what we can do to really engage and motivate our kids in new ways, in different ways. And, that brings me to today’s guest. Sara Gaechter. I had highlighted her presentation in the brochure, the catalog, the schedule there because I thought the session looked pretty intriguing. But, it was taking place right at lunch time and I was getting hungry and I was tired and it was way up on the 6th floor and I was going to be a struggle. But I decided to go and I am so glad I did. First of all the session was packed. It’s in this ballroom, but it’s standing room only. I was watching the whole thing from 15 feet back behind the doors, way out in the hallway. Just hundreds of people there and Sara’s giving her presentation, every time she’d show a different work, people would absolutely freak out about how illegal these ideas were. She’s showing all this awesome graffiti- all of these really good things that famous artists are doing. The social issues that they’re commenting on. The graffiti that they’re doing and half of us were going, “Oh show us more work. We want to see more ideas.” And the other half are just going crazy, “How can you teach your kids about this? What if they could get arrested doing this art? What if you could get arrested because they get arrested?” And they could not handle it. Sara was controlling the room, answering questions one by one with a ton of patience, dealing with everyone in just a great manner and I thought to myself, she would make a great podcast guest. Long story short, she’s here today and hopefully I read that situation right and hopefully she does make for a good guest. But, enough about that. I want to get to talking to Sara because she has some great ideas. She uses graffiti to engage her students into some incredible art-making. She introduced them to artists that are exciting and relatable and she brings those ideas into her classroom in some really interesting ways and she’s patiently waiting for me to quit talking about her so I can actually talk to her. So, let me bring her on. Tim: All right Sara is here with me now. Sara how are you? Sara: I’m doing great, how are you? Tim: I’m doing really well. I am excited to talk to you. We’re going to talk graffiti today. And so we’re going to start out with the big question of why graffiti? 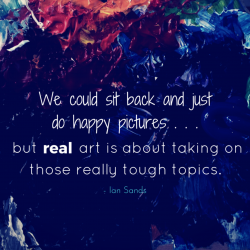 What do you love to teach about graffiti? Why do you love it in your classroom? And, I guess, if I can just talk without actually asking you the first question. 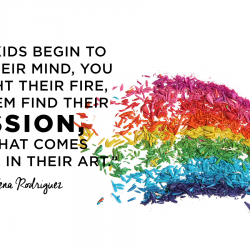 You know for me and my classroom and something that really inspires my kids and motivates my kids for a ton of different reasons and it really kind of breaks them out of the traditional ideas of what art needs to be. I guess I wast to ask, is your experience similar? Why do you love to teach graffiti and more importantly why do your kids love it so much? Sara: Awesome question! Okay, I teach seventh graders in Los Angeles just outside of downtown so my students are growing up in urban environment where they see this kind of art making all around them but don’t necessarily always realize that it’s there because it’s such natural part of their environment. So, when we’re talking about it in class I think the student’s kind of have an ah-ha moment where they start looking at their world in a different way. They start bringing examples into the classroom. I had a student come up the other day, “Miss, I just found this new mural by my house, I mean it was always there but it’s so new and it’s so cool and exciting.” So, just that they’re able to look at their world in this different way I think is really, really special and profound. Tim: Then, my next question for you, I was absolutely fascinated by this when I saw your presentation in Seattle. There are so many teachers who are so concerned about graffiti being illegal. They were just losing it that you would teach this to kids that you might encourage them to do something illegal. So, I guess the question for you, for all those teachers who are really stressed out about this- how big of a concern are the legal aspects for you and how do you deal with that with your students? Sara: Absolutely, yeah I … it was a pretty interesting experience for me presenting as well. I expected a little bit of push back, but there were definitely some people who were very alarmed by the idea, offended even you could say. Sara: I think it’s a really interesting conversation to have and I invite those narratives of concerned teachers to come in because it can be a concerning situation. 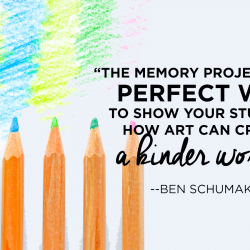 You’re talking about work that is sometimes illegal and you don’t want to accidentally glorify it in your classroom for your students who would never want to do that, but there are ways to educate them about the legal ramifications of the art. I think, personally, the fact that some of the work is illegal kind of adds a extra really interesting layer about what is art and can art be illegal? And, should art be illegal and if it’s illegal is still art? When I teach it to my students I, before I show them a lot of work, we lay out all the legal ramifications and talk about what the consequences are in these works and why some artists are willing to risk those consequences for the sake of their artwork. Tim: Yeah, and I think that’s a really good discussion to have and like you said it adds a little bit of meaning to them and it really helps kids to understand all aspects of it and it’s something that you need to … a discussion that you need to have I guess. Tim: But, if I can ask you too, about, obviously when you’re having this discussion, you’re talking about all these different artist that are working their processes and all that but I want to talk about I guess your favorite artist to teach. So, can you just give me a quick list of maybe a few of the artist that inspire you and the artist that inspire your kids as well. Sara: Sure. So, I always start my unit looking at Banksy and the work of Banksy. A lot of my students come in kind of having heard the name or they’re familiar with it. I think the fame factor that he’s achieved with his whole like persona really, really drives that forward so even if they don’t know who he is, if they found out that he’s famous they’re in. They’re totally in. Sara: So, looking at Banksy’s work first of all, starts … the students start making connections about message and artwork and how you can communicate something really profoundly with something as simple as a two-layer stencil. I usually start off with him and then we move on to Shepard Fairey who is a local artist. He does a lot of work and has a lot of work in Los Angeles and the students who are more involved with the skate culture kind of gravitate towards him because of that aspect of his work and how that’s kind of how he emerged into the street art scene through the skate culture. His work is similar to Banksy with like the messages he putting out, especially now with his focus on environmental work and the Paris Climate Change Conference and all of that. The students are not only looking at work but they’re having really awesome conversations about how you can imbed such profound messages in work that is widely understood and like mass media kind of appeal. The last artist that I’m going to talk about is a local artist whose name is Trashk and I found out about him by walking around in the arts district downtown. I saw one of his pieces, thought it was really interesting, took a picture and tagged him on Instagram and he … we ended up having a dialogue and he even came into our classroom to meet with the students. His work is way more on the illegal side which is why I tend to push it towards the end so as to not glorify that kind of thing. And, at that point because we’ve already been talking about it for so long the students are a lot more adept to kind of processing the added risk in his work and why he would be willing to take those risks for the messages that he’s trying to get out there. Tim: I love what you’re having to say there about artist getting their message across and I kind of want to parlay that into our next question here. What are the big ideas or the big messages that you’re trying to get across when you teach graffiti and I guess part two of that, the artist that you just mentioned, they help illustrate those ideas for your kids or give them example of how they can deal with those big ideas in their artwork? Sara: Yeah, okay, so I think the overarching theme that I usually go for is just the idea that you can make a social commentary through artwork. Now, that’s like a really huge lens to be looking at because there are so many subsets of social commentary topics and activist topics that you can bring into the classroom. The way that I go about it when I teach with my students is we first look at Banksy and his work and the kind of messages that he’s talking about. And that kind of preps students for the range of topics that they can explore, that they can expect in this kind of work. We do kind of like a brainstorming session and students bring up topics that are important to them and feel like affect their lives things like, racism, things like deportation and DACA and immigration. Black Lives Matter, talking about the class divide, women’s rights, general protest topics is usually what we talk about and a lot of those topics are explored in the work of the artist that we’re talking about and even more than that too. So, the way that we talk about the social commentary aspect of the work is really broad and really open and I’m kind of inviting students to apply their own feelings about some of the topics and teaching each other about them, I think is one of the most important things that we do with this unit. The students are teaching each other how they feel and showing their opinions about the messages and it opens up, again, another really interesting dialogue for them to kind of teach and learn from each other. Tim: Yeah, I think that’s a good. I think that dialogue is really important and it’s something we should be striving for with a lot of things that we teach. But, I want to ask you too though about the actual work that you’re creating. What that looks like and I know we saw a lot of examples that you’ve done with large scale works at your school but can you talk about I guess, just the whole variety of projects that you do with your graffiti unit. And, just kind of what your kids learn from each of the projects you do. Sara: I over the last few years that I’ve done this unit, I’ve done a pretty wide range of techniques. And, I mean, it’s such a cool media that artist are constantly adding to that like bank of technique and options I guess. So, I usually start off looking at something simple like stickering. Where students are designing their own tags and looking at the history of tag and writing development and they’re creating their own tag names and their own nicknames which they still use in class today, it’s great. I have a kid who I can only refer to as, “squid”. And, looking at some of that typographical writing and then moving on we do a black-book project where students are trading designs, showing each other their work, giving feedback, it’s really great for critique. I also have the students design and develop throw-ups which are like a simplified, usually two or three letter abbreviation of the tag name that they’ve developed. It’s kind of a design challenge because they have to minimize their use of script and we practice speed. That’s kind of the point of a throw-up tag is the speed in the drawing so we usually trade those amongst each other and they challenge each other it’s kind of like a game. We then move into more of a typographical writing where students are looking specifically at the New York style of writing where the graffiti is a lot more complicated and has a lot more colors. We do that kind of style writing in our black books which the students trade back and forth. We also do a wheat paste project which can be and individual thing that they paste into a notebook or something like that but I’ve done it where I have the students actively pasting them on walls in some sort of like collaborative mural and the topics for those can really run the gamut. There’s not limit for that. We just did a project where the students were asked to think about their dreams for the future. And, that was our overall theme for the mural. Which, we actually did with a visiting artist named Zany which was really, really wonderful and then we usually end our unit off with different kinds of stenciling so either stenciling with the bridge method where they have to cut specific little connectors in between floating shapes on the outside of the paper or students are doing the screening method where all the floating shapes are stuck to a screen so they all stay in place or additive stenciling where they have to create and kind of layer and register different layers of stencil cut outs in order to create and image. I usually end up with the stenciling. It’s a little more involved. It’s asking for higher level thinking as far as the design aspect goes and everything is kind of building to that. Tim: That’s really cool. I think that’s a good way to end the unit, like you said it all kind of builds to that and it’s a good example of scaffolding and taking all that knowledge and putting it all together. If I can ask you, you talked about the big ideas already, but if I can just ask you to wrap it up, like, with the curriculum you do, your graffiti curriculum, is there one overarching goal is it about that social commentary that you talked about? Is it about art-making? Or critical thinking? Or student voice? All of the above? How do you wrap it all up I guess. Sara: Oh, man. I could say it’s all of that and none of that at the same time. I think that all of those little bits again, having students develop their voice. Having students thinking about the world around them and the issues and how art can communicate and affect those issues is all super important but I think my overall goal for this curriculum is just to get the students to have a more profound and like longer lasting experience with art that’s relevant to them. I mentioned in the beginning of our chat that teaching about graffiti and street art gives the students and opportunity to awake and understanding of the art that’s already around them in their lives and I think that having a greater understanding of the impact of that art and how it was created and why it was created has them thinking more critically about the artwork they’re consuming. And, I think that’s my overall goal just teaching students to consume critically by looking at the motives and the bias and the privilege of the artists and how they would do it differently and maybe their artwork is biased and some kind of a way. Just, making those connections with art that exists in the world and the art that they connect. In a way that is relevant to them in their lives right now. Tim: Yeah, that’s really, really well-said. And, I think that’s a very admirable goal and I also think that’s a good place to kind of wrap up our conversation so Sara, thank you so much for joining me, it has been awesome to talk to you and I really appreciate you sharing all of your ideas so thank you. Sara: Thank you so much for having me. Tim: As I said in the beginning of this episode, graffiti can bring up feelings of discomfort. Feelings of danger and you see that illustrated in the actions of those teachers that are just kind of freaking out, they can’t quite handle these ideas being introduced to their kids. And, I think the worries about illegal vandalism of public property of private property, those are legitimate but as teachers we can teach our students about the difference between legal and illegal and more importantly you can involve them in some work that is meaningful and some work that they’re going to love. 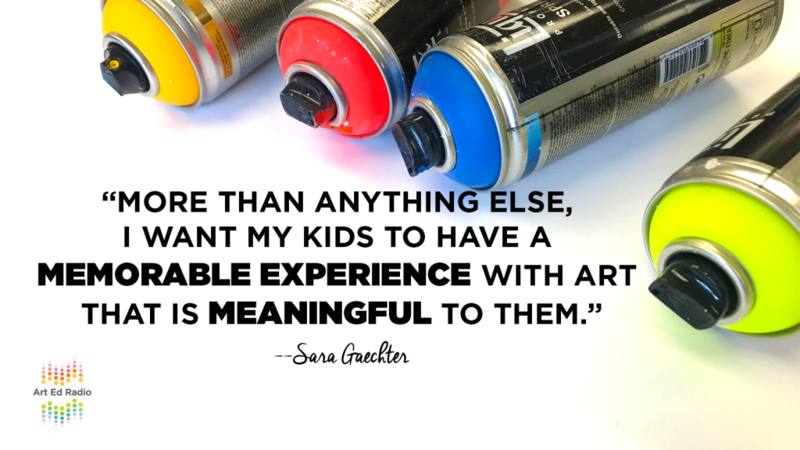 If you want to learn more about teaching graffiti and how to do it, obviously Sara has some great ideas here in this episode but there’s so many more resources on AOE. First of all Sara helped me write and article on graffiti artist that you need to know. That’s going to becoming out on Friday so make sure you keep an eye on the AOE site. Or the Facebook page or wherever you get your AOE information. Hey you can go back and listen to the episode I did with Matt Christenson last year which has a similar perspective on why you should teach graffiti, but some much different ideas on how to do it. And, finally Matt also has a graffiti PRO learning pack that is being released on Friday as well. It has 15 videos, almost a dozen resources, all of which are dedicated to showing how to bring graffiti into your classroom. If you’re not a PRO member you can still get a 30 day free trial at theartofEed.com/pro. And that will do it for us so I hope you enjoyed this episode and more importantly I hope you check out all the amazing resources coming your way on Friday. 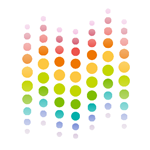 If you’re interested at all in teaching graffiti and you should be because your kids are going to love it, there are so many resources and so many options out there for you. It’s going to engage your kids and motivate your kids and get kids invested in your class. It’s just up to you to find the right way to do it.